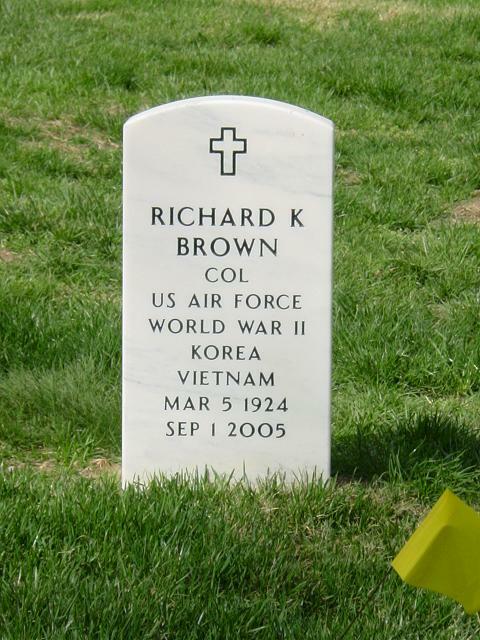 Richard Keith "Charlie" Brown, 81, a retired Air Force colonel and former executive with the old Lockheed Aircraft Corp., died of a heart attack September 1, 2005, at Powhatan Nursing Home in Falls Church, Virginia, where he lived. Colonel. Brown, a native of Oskaloosa, Iowa, who was raised in Oakland, California, enlisted in the California National Guard at 14. His Sergeant discovered his age, Colonel Brown once said, and called his father, who allowed him to stay in the Guard as long as the sergeant kept an eye on him. He joined the Army Reserves while attending the University of California at Berkeley and was called to active duty in 1943. He became a navigator/bombardier and flew combat missions in the Mediterranean. After World War II, he served with the Air Force Office of Special Investigation and trained as a jet pilot. He served in California, France and Germany. He worked for two years at the Central Intelligence Agency in Washington and then was assigned to the Pentagon to coordinate support for troop movements during the Vietnam War. He retired in 1972 while assigned to the Air Force deputy chief of staff's office, where he was in charge of the transport of the secretary of state around the world. Among his decorations were two awards of the Legion of Merit and the Air Force Commendation Medal. Colonel Brown joined Lockheed in 1973, working in Greece and then in Arlington. He retired a second time in 1987. He enjoyed lawn care and gardening. He was a member of the Washington Golf and Country Club, the Bolling Officers Club, the Arlington Rotary Club, the Daedalian Society and the Association of Former OSI Special Agents. Survivors include his wife of 52 years, Ruth Cass Clifford Brown of Arlington; three children, John Patrick Brown of Raufoss, Norway, Catherine Cass Fenn of Herndon and Deborah Lynn Benson of Arlington; six grandchildren; and two great-granddaughters. On Thursday, September 1, 2005, of Arlington, VA. Loving husband of Ruth C. Brown; devoted father of Catherine Cass Fenn (William), Lt. Col John P. Brown, USAF Ret. (Guwn); Deborah Lynn Benson (Ben); grandfather of Robert, John, Chase, Michael, Jamie, and Mark; great-grandfather of Abigail and Sarah. Service will be held at 1 p.m. Monday, November 14, at Ft. Myer Post Chapel. Interment Arlington National Cemetery with Full Military Honors. It is suggested memorial contributions be made in his name to Capital Hospice of Northern Virginia, P.O. Box 1576, Merrifield, VA 22116-1576; or to the American Parkinsons Association, 1250 Hylan Blvd, Suite 4B, Station Island, NY 10305.